Just a week after I had published my report on several new Champagnes released by major houses (Champagne on the Move), a sample of yet another brand new wine landed on my desk. To round out that picture I have added this wine to that report, but it is such a terrific wine that I wanted to highlight its release separately too. Gosset, the oldest Champagne house founded in 1584, is hugely respected producer and their wines have garnered many high scores from me over the years. The introduction of this Blanc de Noirs by cellarmaster, Odilon de Varine, is their first Champagne made only from Pinot Noir. 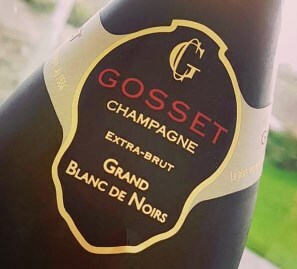 Source from Grand Cru and Premier Cru vineyards, like all Gosset wines, the base wine did not undergo malolactic fermentation, and it spent a full nine years in Gosset’s cool cellars before release. The Champagne is also Extra Brut, with just 5g/l of dosage, which reinforces its delightful freshness without making it at all austere. It’s a fabulous new wine, though with strictly limited availability. Right now you should be able to source it from Harvey Nichols or The Great Grog Company. (2017) This Blanc de Noirs sourced only from Grands and Premieres Cru villages spent some nine years slowly developing in Gosset's cellars. Bottled with only 5g/l of residual sugar, and made from 100% Pinot Noir, it has a burnished light gold colour and immediately involving aromas: it is meaty and dense, with pastry notes and lemon, but there's a sense of grip and concentration too. In the mouth it is a glorious mouthful of Champagne: concentrated, searingly intense, yet shimmering with light and elegance. A delicate, featherweight mousse and fine, long acid structure sees to that, the sheer weight of the initial attack tapering beautifully to a crisp, focused and precise finish.